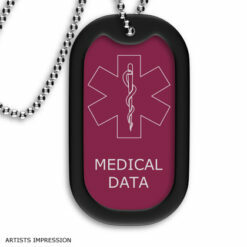 This medical ID tag comes in four different colours. The medical symbol on the front clearly identifies it as a medical ID and the back has room for up to 5 lines of engraving. Please allow up to 5 days for dispatch of engraved items. 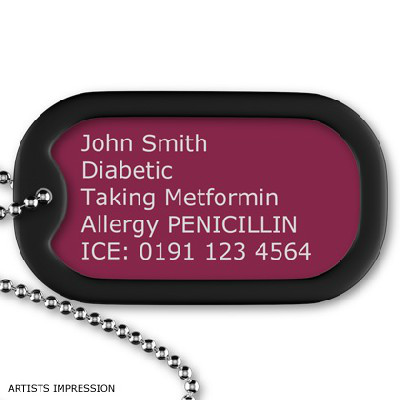 This colourful medical ID tag features the internationally recognised medical symbol on the front. 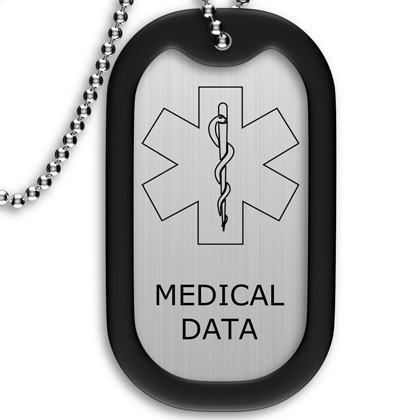 Below the symbol, the words “MEDICAL DATA” are in bold. The dog tags can be engraved with your information on the back. In addition to this, you are allowed up to 5 lines of text (20 characters per line). The dog tag is supplied with a 26-inch chain. Available in four colours. If you would like us to engrave the tag, please check yes on the “Do you require personalisation?” box and fill in your engraving in the space provided. If you would prefer to have it engraved by your local jeweller, check no. Please allow up to 5 days for dispatch of the order if you choose to have it engraved with us. Bought this for my 10 year old daughter. It is quite big and comes with a long chain, so will not be very comfortable for her to wear under her clothes. We changed the chain for a shorter chain we have at home. The writing is also not very clear to read. It is quite bulky so we may end up removing the rubber around the outside. 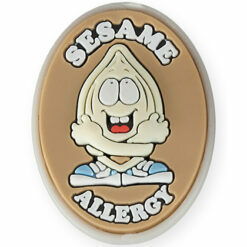 I would expect that this product is suited to adult men.